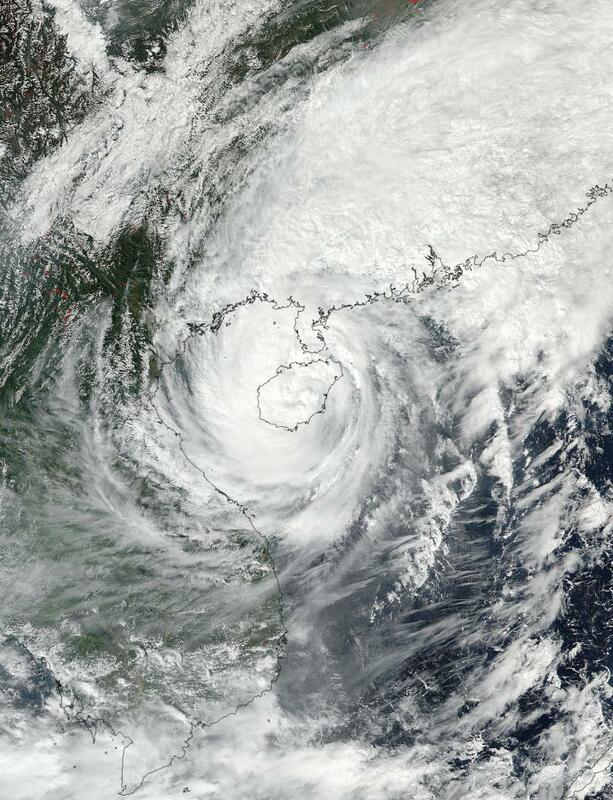 As Tropical Storm Sarika moved over Hainan Island, China, NASA-NOAA's Suomi NPP satellite captured a visible picture of the storm as it made a direct hit. On Oct. 18 at 1:55 a.m. EDT (0555 UTC) the Visible Infrared Imaging Radiometer Suite (VIIRS) instrument aboard NASA-NOAA's Suomi NPP satellite provided a visible-light image of the storm. The image showed the center of circulation covered by clouds. Forecasters at the Joint Typhoon Warning Center noted that infrared satellite imagery showed that the low-level circulation center is weakening rapidly and that the strongest thunderstorms within the tropical cyclone appear to be disorganized. At 11 a.m. EDT (1500 UTC) on Oct. 18, Sarika was centered near 19.8 degrees north latitude and 109.7 degrees east longitude. That was about 189 nautical miles east-southeast of Hanoi, Vietnam. Sarika's maximum sustained winds dropped to 63 mph (55 knots/102 kph) and it was moving to the northwest at 11.5 mph (10 knots/18.5 kph). Sarika is moving northwest and is forecast to cross the Gulf of Tonkin and make final landfall in northern Vietnam. A Severe Tropical Storm Warning is in effect from central to northeastern Vietnam. For forecast warnings and updates from the Vietnam National Center Hydrometeorological Forecasting, visit: http://www.nchmf.gov.vn/web/en-us/104/102/30998/Default.aspx.